Swansea have exceeded many people’s expectations. 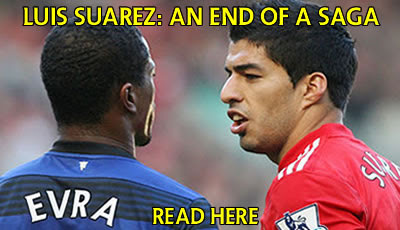 The team have won over the hearts of a growing number of football fans who love the Premier League. When Swansea were promoted, many questioned whether the Welsh side could apply their neat passing game to England’s elite league. Seventeen games into their Premier League season, the team have managed to maintain their passing strategy to fantastic effect. The evidence backs up just how effective their passing system has been in England’s top flight. Firstly, the team have a possession record which is joint third best in the Premier League. The team average possession of 56% in each game which is a stat shared with Chelsea. Not only this, Swansea have a possession record which is better than, Manchester United, Liverpool and Tottenham. This is outstanding. The Swans have pitted their wits in England’s highest league and yet they can still retain the ball. The players, managers and coaches deserve huge praise for their mental strength and belief in their way of playing. After all, some teams in the Premier League, have often discarded their philosophy because of the pressure the opponents are putting them under on the pitch. There is more glorious evidence of the effectiveness of Swansea’s philosophy. So far, Swansea have the third best passing accuracy in the whole of the Premier League. The Swans of passing accuracy of 86.5%, Chelsea shade Swansea in second place by 0.30%. It’s pretty incredible. Swansea have a better passing accuracy than the league champions Manchester United and arguably, ‘the best passing side’ in England Arsenal. What makes this more incredible is that Swansea are a newly promoted side and many of their players have not played Premier League football before. Not only this, the Premier League is played at an incredibly high tempo most of the time, yet Swansea have managed to keep a cool head and maintain their accuracy. It shows Swansea’s system was built for the Premier League and the highest levels. After all, the philosophy is evidently working. The team are passing more accurately than far more established Premier League sides. However, Swansea need to be praised for effectively executing their philosophy. After all, its one thing to attempt to play attractive keep -ball football and it’s another to actually be able to do it. Swansea to their credit have managed to implement it. Most clubs, pay multi millions in players, coaches and managers in the dream of playing like Swansea. But very shrewdly, Swansea have managed to be able to execute it without having the most technically gifted players in the world. The Swans compensate the lack of sheer technical excellence in the side through working incredibly hard. A clear example of this is the defensive work of Swansea’s wingers. Although their system demands the wingers to be on-top of their game offensively, Swansea’s wingers, Nathan Dyer and Wayne Routledge track back ferociously to win the ball. Against Newcastle, Routledge made 5 tackles, four were successful. Collectively Swansea are hungry and motivated to succeed in the Premier League. This has been an underlying reason as to why the team’s system has been so impressive. Furthermore, this determination to win the ball back has made Swansea so hard to be break down. So far, the Swans have conceded 21 goals. This is a decent record for a newly promoted side. It’s better than the other two promoted sides, Norwich (31 goals conceded) and QPR. (31) This solid defensive record also links very closely to Swansea’s ball retention ability. After all, the opposition struggle to get the ball back from The Swans, let alone get a chance on goal. There is evidence of Swansea’s solid defensive record. Swansea have the best defensive home record in the Premier League. After 8 home games, the team have only conceded 2 goals. This is nothing short of outstanding. Swansea’s home record is as solid as any established Premier League side. It’s almost unheard of that a promoted side can have such a sturdy defence at home. Most promoted sides often make woeful defensive lapses. But this has not been the case with Swansea. The team look competent, solid and cohesive as a collective unit. But the simple maths will tell you 18 out of 20 of Swansea’s goals have been conceded on the road. The team are clearly not as strong on the road as they are at home. On the road, Swansea struggle to restrict the amount of chances the opposition create. This has been a leading factor as to why the team have struggled to win a single game on the road. 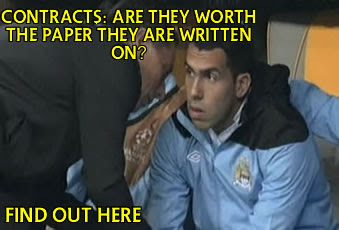 At the moment, the team are seriously craving players with Premier League experience. The lack of experience has cost Swansea points on the road. For example their away game at Wolves. For most of the game Swansea were two up and in control, but when the momentum was with opposition, the Swans crumbled and surrendered their two goal lead. If the team had more Premier League experience it would lead to the team feeling more assured and restricting the team falling deeper into their own half, thus asking for the opposition to attack Swansea. Another reason why Swansea have been so poor on the road is because the team have struggled to create sufficient chances. 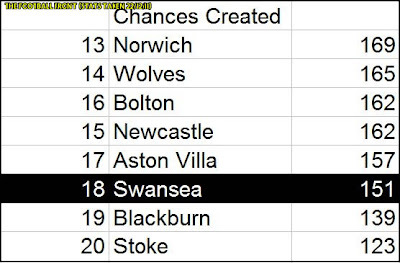 This season, Swansea have created 151 chances, which is the 4th worst in the Premier League. What makes this statistic worse for Swansea is the team normally spend most of the game in possession of the ball. But even when dominating possession, the team struggle to consistently penetrate the final third of the pitch. However, over time, the team will create more chances per game. After all, as the team’s philosophy develops and the teams coherence grows, the Swan’s tentative mindset will transform into confidence. But this confidence will take a massive boost if Swansea manage to bring in more technically gifted attacking players. Swansea are missing someone who can create something out of nothing. Yes, Mark Gower has been fantastic in the middle. But if the Swans are to create more chances, more creative players are needed within the side. This struggle to create chances explains why Swansea have not scored enough goals this season. Swansea have scored 16 goals this season, which is the second worst in the league. However, if Swansea could create more chances, the goals which will eventually flow in. But the Swans have also been guilty of missing clear cut chances. Take Swansea’s game at home to Man United. The likes of Scot Sinclair missed guilt edged chances which perhaps cost the club at least a point in that game. Besides this, Swansea have been a great addition to the Premier League. The team have been a joy to watch and look completely at home in England’s highest division. Indeed, the team may not have taken the Premier League by storm. But the Swans have made a lasting first impression on many. Long may the Swansea revolution continue.